The universe is so perfectly detailed and brilliant that it’s challenging to picture yourself in it. Who doesn’t want to be a Jedi? Star Wars wasn’t ever only about the films. It is good vs. evil, vehicles and weapons making weird noises, brilliant and funny characters and cool creatures. It is a great, classic storytelling infinitely entertaining, with the right formula of action, romance and angst. We loved all the toys created around Star Wars expanded universe which is built up by the addition of new planets, new aliens, character backstories and Star Wars complex technology. Struggling of Good and Evil led to epic space fights which continue to have impact to millions of fans of different cultures and generations around the world. Star Wars is part of us and we are part of it. 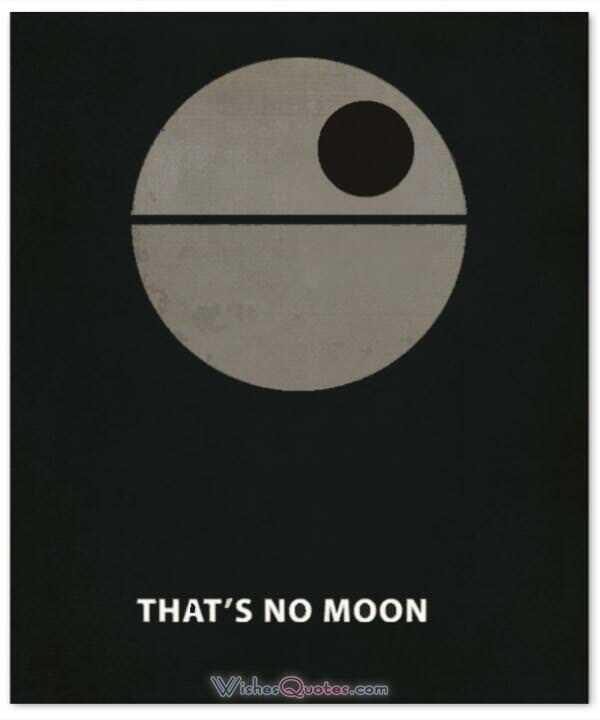 Even those who are not Star Wars fans may have heard some of the famous sayings that have been quoted in their popular movies. 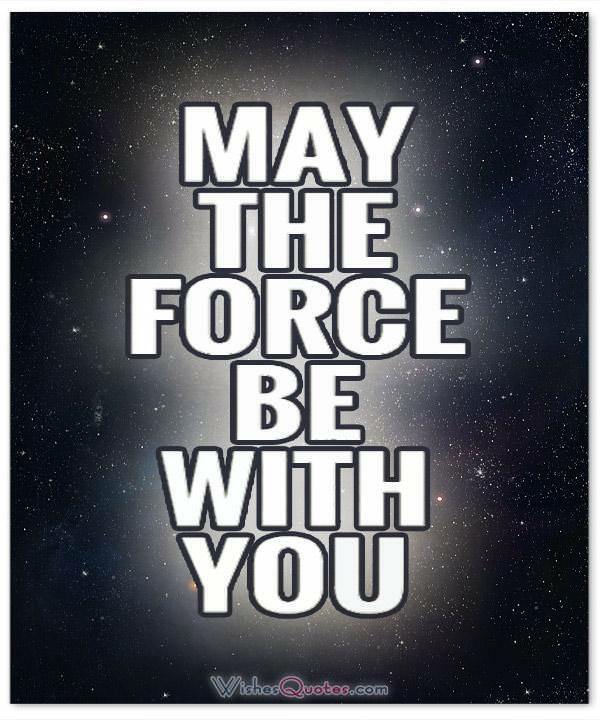 Star Wars fans have linked these quotes to their everyday life. Many big ideas captured in a few lines of dialogue between the characters or simple memorable phrases that are used by many people in everyday conversations. Almost all of us know at least one person that loves Star Wars! 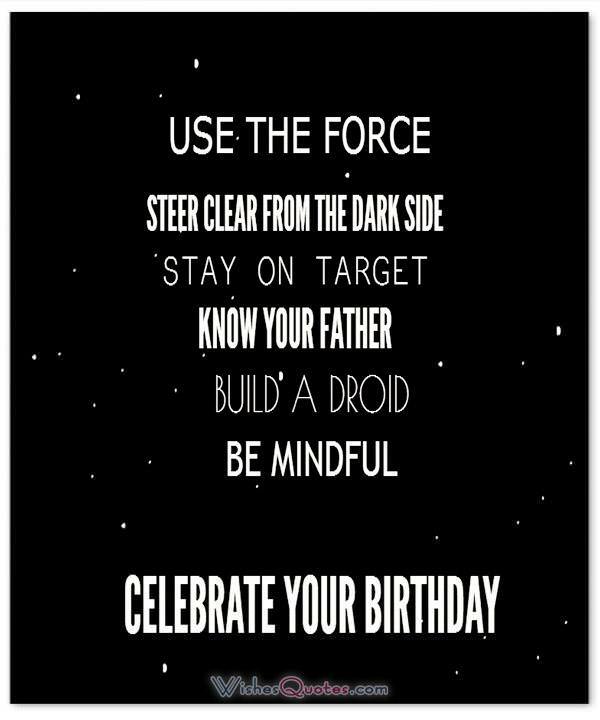 Say good morning or happy birthday to your friends by sending them a Star Wars theme greeting card. 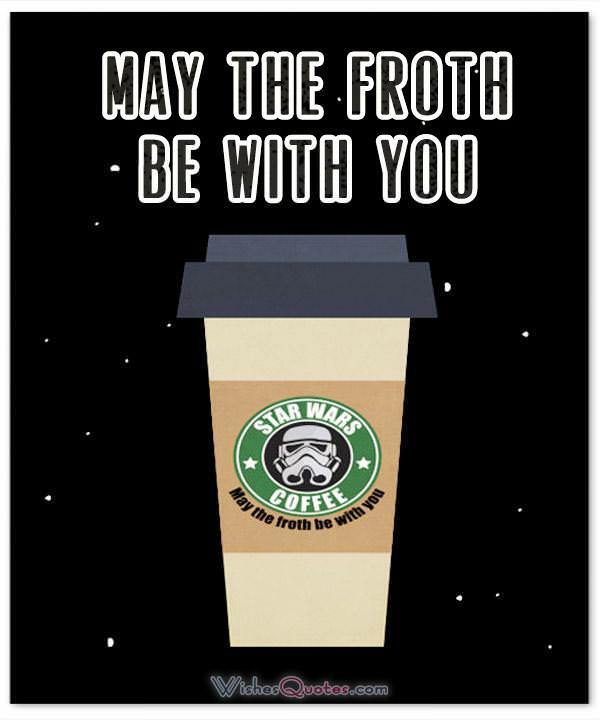 Each card is based on a famous Star Wars quote, which is used in a witty way to make your friend’s day. 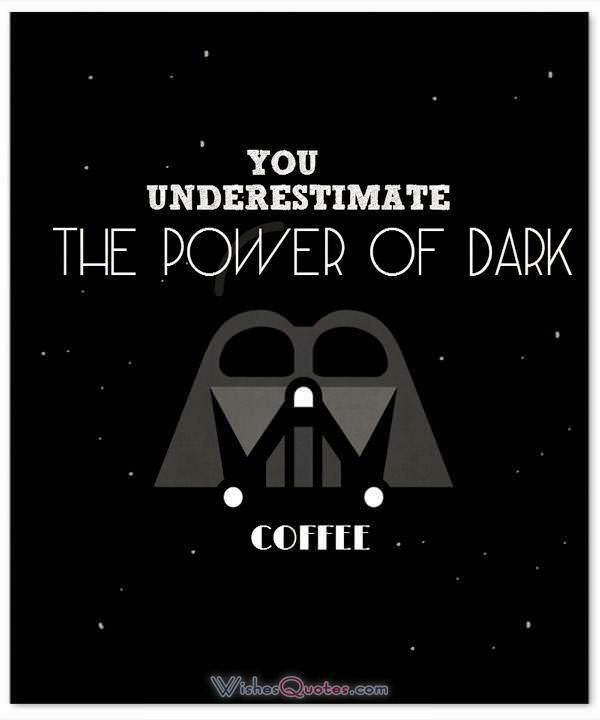 Use your sense of humor and send your co-worker a good morning message from Darth Vader. Browse our expanding collection of greeting cards and find the best message to send. Share funny new quotes and messages to nicely accompany the aroma of a morning coffee with a delicious doughnut. Funny and inspirational message cards to remove boredom and start a nice and easy phone or desktop chat. Even in the middle of a bad day, a funny, unexpected illustrated quote will change the mood, adding a special note of humor. Awww! But I was going into Tosche Station to pick up some power converters!!! Ben! I can be a Jedi. Ben, tell him I’m ready! (Thumps head on ceiling.) Ow! Boring conversation anyway. Luke! We’re gonna have company! Bounty hunters! We don’t need this scum. Boy, it’s lucky you have these compartments! But how could they be jamming us if they don’t know… that we’re… coming? For over a thousand generations, the Jedi were the guardians of peace and justice in the Old Republic — before the dark times. Before the Empire. I’ve just made a deal that will keep the Empire out of here forever. 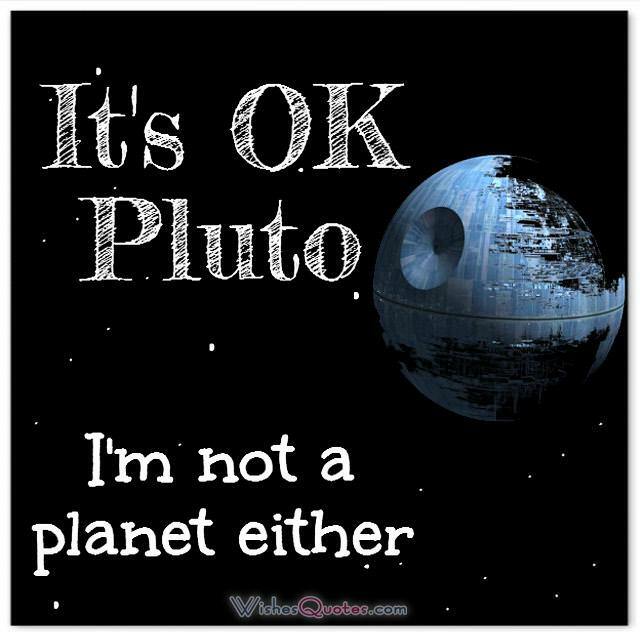 If they follow standard Imperial procedure, they’ll dump their garbage before they go to light-speed. Then we just… float away.…With the rest of the garbage. It’s not fair! They promised me they fixed it! It’s not my fault! It’s not impossible. I used to bullseye womp rats in my T-16 back home, they’re not much bigger than two meters. Keep your distance, Chewie, but don’t, y’know, look like you’re keeping your distance. (Grumbled questioning bark.) …I don’t know. Fly casual. Luke, you switched off your targeting computer — what’s wrong?…Nothing! I’m all right. Now, witness the power of this fully operational battle station. R2-D2, you know better than to trust a strange computer! Shut him up or shut him down. So what I told you was true… from a certain point of view.…A certain point of view?! Strike me down, and I will become more powerful than you could possibly imagine. That… is why you fail. Told you I did. Reckless is he. 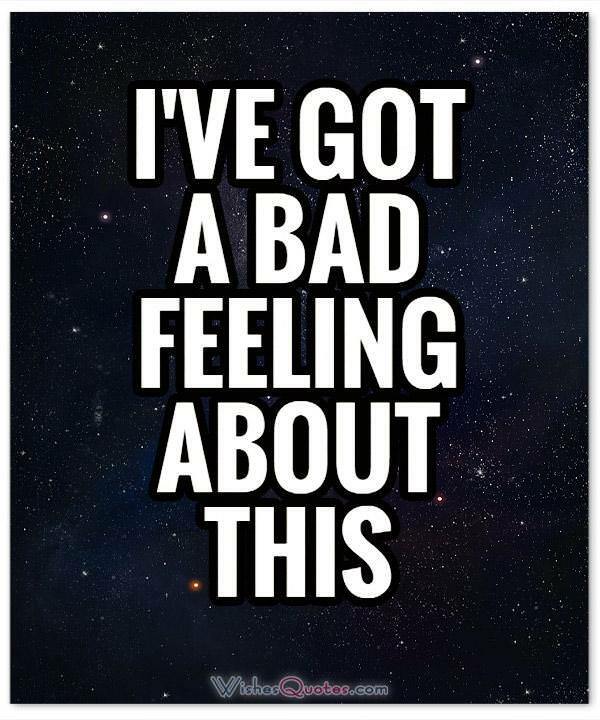 …Now, matters are worse. Traveling through hyperspace ain’t like dustin’ crops, boy! Uh, we had a slight weapons malfunction, but uh… everything’s perfectly all right now. We’re fine. We’re all fine here now, thank you.(Winces.) Uh, how are you? Ugh. And I thought they smelled bad on the outside. Well, you said you wanted to be around when I made a mistake.…I take it back! Would somebody get this big walking carpet out of my way?! Yeah… you’re a real hero. You are a member of the rebel alliance, and a traitor. You do have your moments. Not many, but you have them. You don’t have to do this to impress me. You know, that little droid is going to cause me a lot of trouble.…Oh, he excels at that, sir. You will find that it is you who are mistaken… about a great many things. You will never find a more wretched hive of scum and villainy. 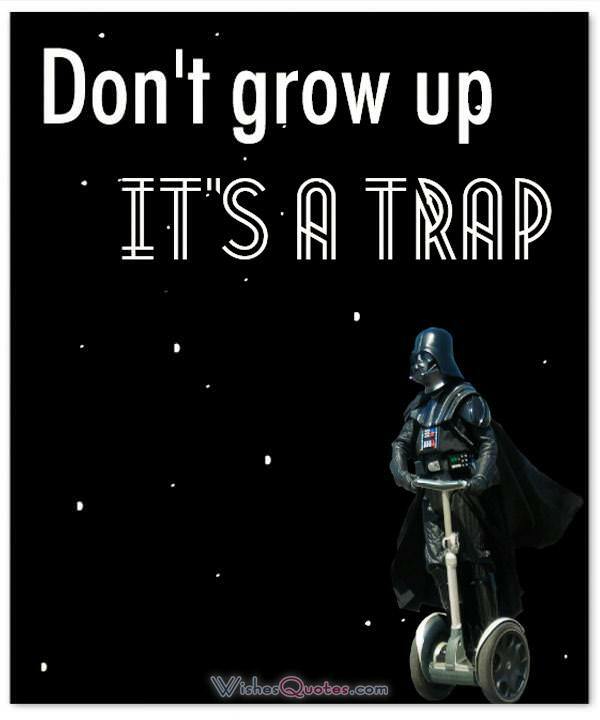 …We must be cautious. You’ll find I’m full of surprises! Your weapon… you will not need it. He certainly has courage….Yeah, but what good is that if he gets himself killed? He is as clumsy as he is stupid! Hey, I think my eyes are getting better. Instead of a big dark blur, I see a big bright blur.…There’s nothing to see. I used to live here, you know.…You’re gonna die here, you know. Convenient. 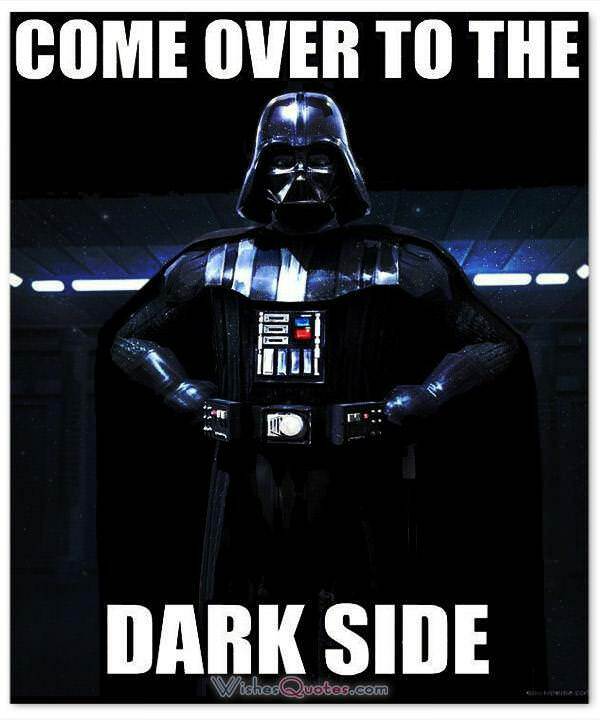 I assure you, Lord Vader. My men are working as fast as they can.…Perhaps I can find new ways to motivate them. I happen to like… nice men. 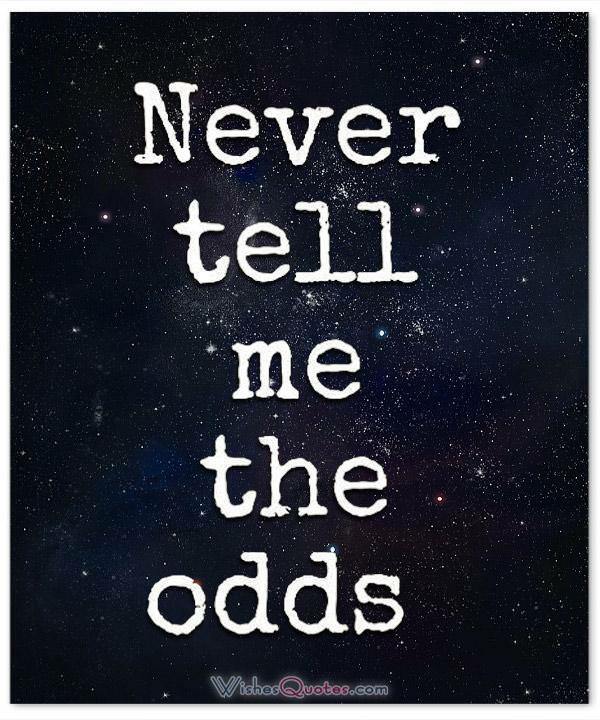 I never doubted you! Wonderful! I saw… a city in the clouds. I think I just blasted it. I’m Luke Skywalker? I’m here to rescue you!…You’re who? 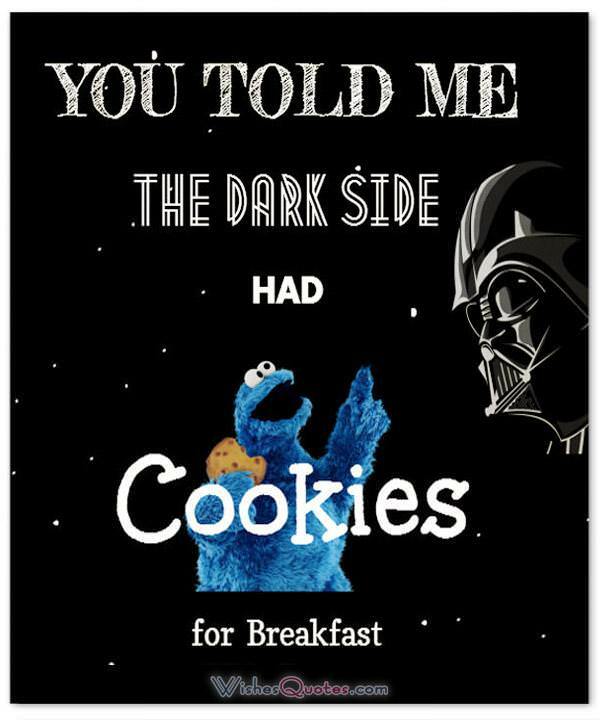 You told me the Dark Side had cookies for breakfast. 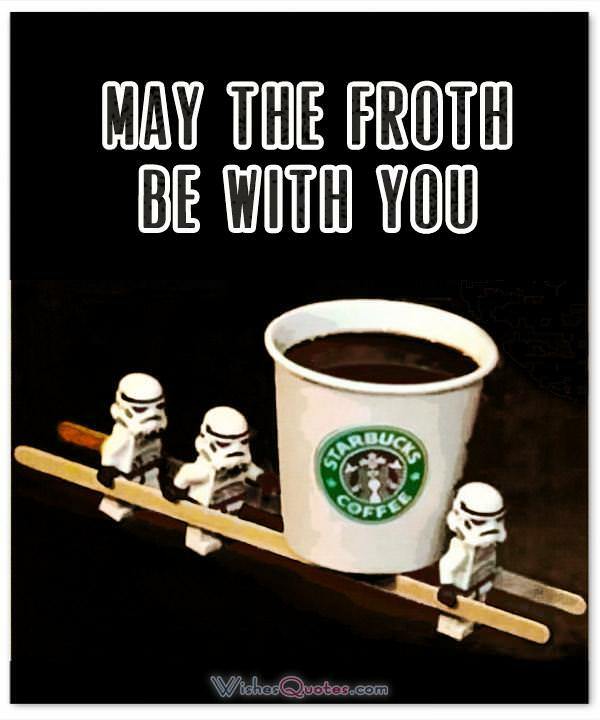 Use the force! Celebrate your birthday!